The only way I've found thus far in GIMP to get any HSL reading is pretty laborious. I have to decompose my image into HSL and then check the % values for each layer. I want an easy or automated (or self-scripted) way to turn a picture into HSL, and then set the Alpha (as a [0,1] value) to its Lightness (as a [0,100] value). 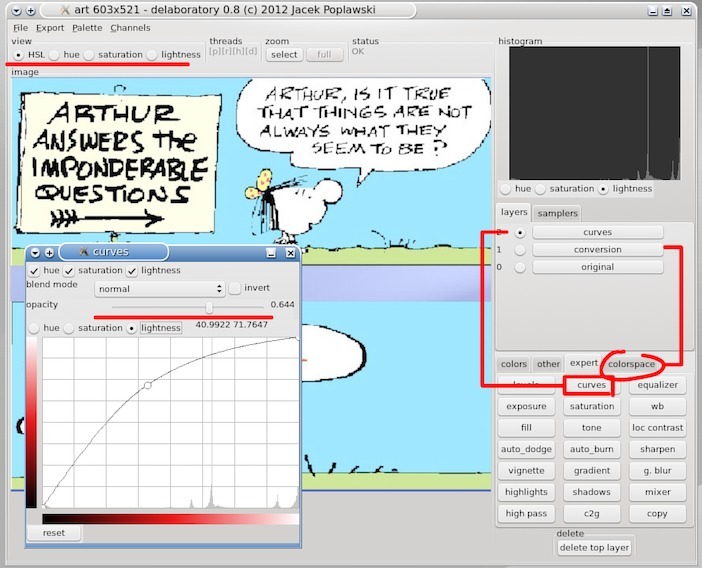 Now GIMP has very limited mixing operations from layers to alpha channels and so on. I can decompose my image into HSL. Then I can add a layer mask on the lightness, fill it with a grayscale of the lightness, apply it to the image and then I have a alpha channel that I would want to use to turn these three components + alpha into one HSLA image. But, the original image also had an alpha channel which would complicate things. But I just overwrite that. I would make sure any transparent pixels are set to black. Not good enough for more complicated images, but then I run into my problem with the color2alpha being a destructive operation. It would not be in the HSLA model. HSL is called the bi-cone whereas HSV is the mono-cone. If I knew how to convert e.g. GIMP's RGBA into HSLA and then adjust my image and then save that (or make it RGBA first again) that would be awesome. Does anyone have any pointers on how to start doing that? ..If I knew how to convert e.g. GIMP's RGBA into HSLA and then adjust my image and then save that (or make it RGBA first again) that would be awesome. Export or change back to sRGB and export. But unfortunately that code calculates hue using the hexagonal coordinates warping it into a circle (with angle hue and distance chroma) and I will need to have the rectangular to polar coordinates. Nevertheless, it would seem easy enough to adjust that. My many thanks for introducing me to this language :). It seems like a cute functional programming language. Also, the function calculates "V" or "value" as the maximum R,G,B component. This is the HSV model that GIMP uses. But I need "L" or "lightness" as the average of the minimum and the maximum value. Also easy. The saturation value is then not hard to calculate. No, the difficulty lies in that the polar coordinates I need use trigonometry and the Wikipedia article that describes it (never have seen such a useful Wikipedia page in my life!) only lists the reverse operations for the hexagonal system most commonly used. But, not something beyond the realm of the possible :p. I'll just need to think about it for a while. But you've been wonderful once more :). I think I started at 9:00. It has taken me about 4 hours to implement my written-from-scratch converter functions that can convert any single pixel value from RGBA to HSLA and back without any loss of accuracy --- although I haven't checked for complete equality yet. The funny thing is -- my values are [0,360) for hue, [0,100] for saturation and [0,100] for lightness -- as soon as I start ROUNDING these values after the transform to HSL (and prior to transforming back to RGB) I get the same kind of artifacts (it actually looks like clipping) that I got in my other thread where I mentioned the weird stuff that happens when you change transparency values. APPARENTLY these artefacts are getting introduced (or perhaps some of them?) because of rounding -loss-of-information due to being converted back to RGB? But HSV itself is a flawed model that no one should use. These models arise from the RGB cube being put on its 'black' apex which causes the projected surface (on the floor surface on which the black apex rests) to become a hexagon. The projection (distance from the vertical axis) then results in a "chroma" value being created. HSV and HSL only differ in what happens next. In HSL, the cube stays a cube. The hexagon (chromatic distances) usually gets warped into a circle as seen from the top down. Then the question is what becomes of the vertical distance along that axis. In HSL it remains a value congruent with the cube itself. White remains at the top of a cube. I do not know why, HSL seems strange because it only ever uses two of the components to calculate the L value. But for some reason it is totally and completely and perfectly harmonious in all respects. The alternative is to use the average of all three values. But the base of these chromatic shapes is always - somewhere - a hexagon. HSV creates a single hexagonal pyramid which is a very bad shape. HSL creates a dual hexagonal pyramid, which is a good shape. I'm not sure what HSI does. It creates a weird shape, for sure. This is the only harmonious shape. No one should use HSV. GIMP should not use HSV. In HSV, white is treated as a primary or secondary colour, while black is the only exception to everything. It is weird, unhealthy. 1. The HSL model expands chroma distances for every level of lightness to always cover the entire reach of [0,1] or [0,100]. The hexagonal bi-cone is expanded to a hexagonal cylinder. * tangent of the angle of the hue equals the proportion of the height vs width of a unit triangle drawn from the center of the circle, to the actual edge of the hexagon, in a unit circle. Because it is hexagon and not a circle, the actual maximum height (y-axis) of the triangle is less than 1, being ½√3. The maximum width (x-axis) is 1. We call these values α and β. With α being the distance on the x-axis, and β the distance on the y-axis. * the actual chroma squared (diagonal, radius) is equal to the α squared + β squared (pythagoras). * the tangent can fall into one of four quadrants defined by 0, ½π, π, 1½π, 2π (or 0°, 90°, 180°, 270°). A positive tangent can mean either quadrant 1 or 3, a negative tangent would mean quadrant 2 or 4. * this is enough information to obtain the actual α and β using angle and chroma (the polar coordinates usually denoted as (φ, r). This is something every scientific calculator can do. Note that our chroma here is the actual distance to (the edge) of the hexagon, not to (the edge) of the circle on its outer edge. Actually, it appears to be faster too :P :P :P. Haha, it took me a while to figure out what I was doing anyway ;-). then find which of R,B,G is the largest value (max) based on their differences and use that to calculate the other two. Well, that one is new for me. If I were to have to use your system, I would throw it (or myself) out of the window within a split millisecond. Yes, I know. H is the same for HSV/HSL, so I use the Pointer dialog to find my Hue if I need it. Also, in a colour select tool (the way GIMP shows H S V R G B) you can also easily find the hue.